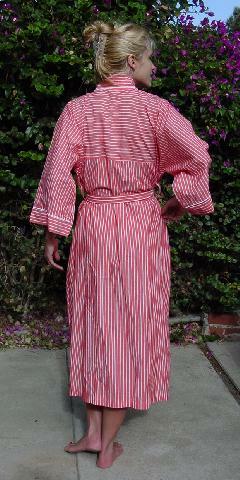 This light persimmon and white striped robe was made in Macau and is 100% cotton. It has raglan sleeves and two front pockets. There are side double belt loops to give you that perfect comfortable fit. The tag says Christian Dior Monsieur. So buy it for him as a present and you can wear it. It's a great color and quite comfortable. It was used for a photo shoot for a magazine. 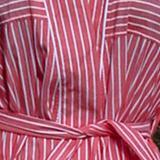 neckline to end of sleeve 23"
shoulder to hem 49 1/2"
armpit to armpit 25 1/2"
belt 72" by 2 1/4"